WORCESTER – When Unionville had its 19-game win streak snapped by Springfield-Delco in the District 1 semifinals, the Indians’ season turned – for the better! Since that defeat, the Indians refocused. 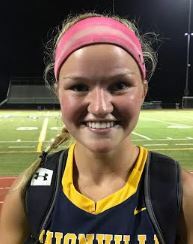 And on Tuesday after a 90-minute rain delay pushed the start time at Methacton to 8:30 p.m., Unionville dominated Garnet Valley, 14-4, to earn a trip to Saturday’s PIAA Class AAA championship game. The Indians (23-2) will play Manheim Township at noon for the crown at West Chester East. Manheim, the District 3 champion, toppled Springfield, 12-10. Unionville – the third seed from District 1 – had fallen to Garnet Valley, 7-6, to open the season before its long win streak. But Garvey scored five goals and helped her team dominate the draws while six others scored for the Indians. “I was confident that our team had improved (since our first meeting with Garnet Valley),” said Garvey. “I am super excited! Emma Malone added two goals and two assists while Claire Donovan and Mauria Blair each scored two goals for the Indians. Mina Scott had a goal and two assists. Madison Doucette posted five saves when Garnet Valley did have the ball, which was not often. The game was 2-2 midway through the first half when Unionville completely took over, going on a 4-0 run to close the first half and extending the lead to 13-2 midway through the second half. “That was fantastic lacrosse,” Garnet Valley coach Jenny Purvis said. “I said to (our) girls after the game that sometimes you cause the loss; I didn’t feel like that today. Unionville coach Suzanne Sheehan believed her team, the undefeated Ches-Mont League champion, was capable of playing at this level. “We’re all excited,” she said. “We all felt it as we ran through the season. We started to feel it get closer and closer. We saw the passion and it continued to develop. Purvis said her team’s loss could not overshadow a great season, which included a Central League title and a District 1 crown.